Yesterday was (almost) literally a red letter day in the MM household. 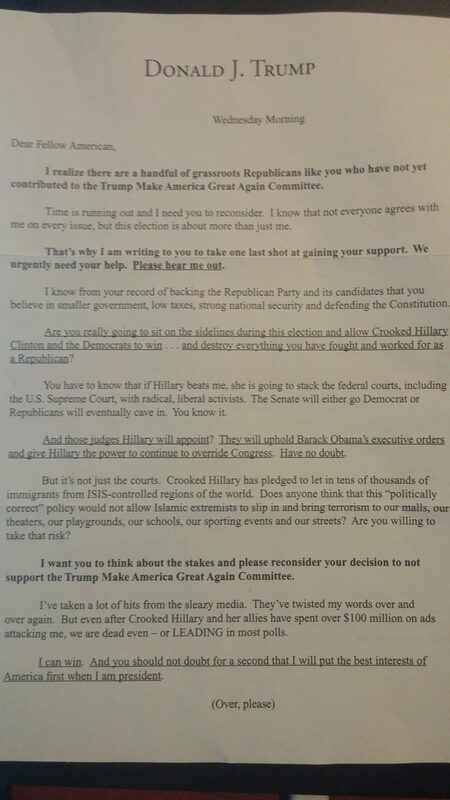 A letter from The Donald himself. Apart from the fact that the actual letter itself was not printed in red paper, it was a red letter day nonetheless. Yup, yours truly received a letter addressed to “Dear Fellow American.” I felt humble right from the get go. Anyway, as I read through this I realised I was not reading a letter from an adult. Nope, I was reading one from a 12 year old running to be middle school president. (Is there such a thing?). Take out the Trump logo and you might think that too. Consider this wonderful piece of prose. Written by Donald or a 12 year old? As I said, embarrassing. For the GOP, and the country.